Laralthir is killed at the start of the Knights of the Nine quests. 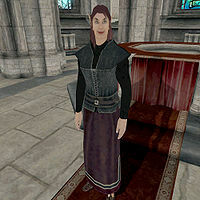 Laralthir is a Bosmer healer at the Chapel of Dibella in Anvil, who seems to really admire Countess Millona Umbranox. Laralthir wears a middle-class outfit consisting of a dark shirt, burgundy linens, and a pair of quilted shoes. She carries the key to the chapel as well as a small amount of gold. She knows the standard leveled healer spells. When you first speak with Laralthir, she will introduce herself, as well as show her envy towards the Countess: "Me? I'm just Laralthir. I wish I were the Countess of Anvil, to tell you the truth. That Millona Umbranox, she's got it made... [Sigh.]" Ask about Anvil, and she'll go on about town life: "Restless folks like you don't much like town life. Too slow and easy. For you, the life of the rover... gold and glory, blood and treasure." As soon as you install the plug-in Knights of the Nine, Laralthir is killed. Once the plug-in quests are all completed (through Umaril the Unfeathered), she is replaced by a new NPC, a male Bosmer named Amragor. 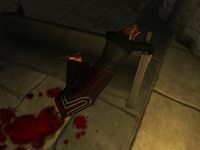 Laralthir is one of the few NPCs in the game to be marked for a scripted death but not to be flagged as essential. Thus it is possible for her to effectively "die twice". This page was last modified on 3 February 2017, at 20:39.